Custom Vacuum Chambers | Meyer Tool & Manufacturing - Meyer Tool & Mfg. Meyer Tool supplies custom chambers for ultra-high vacuum applications. We select the highest grades of materials consistent with UHV applications. In the manufacturing process only procedures and materials consistent with the UHV application are utilized, e.g. in the selection of machining coolant. To minimize outgassing rates we adhere to stringent UHV cleaning procedures, which may utilize electropolishing or ultrasonic cleaning of vacuum surfaces. 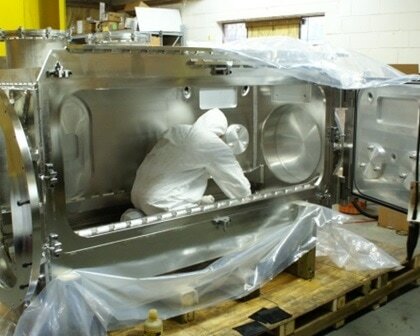 For final assembly of UHV vessels and equipment we maintain a clean room. Aluminum has some unique advantages when it comes to vacuum chamber design. Aluminum is light weight and it is easily machined. Aluminum is also is non-magnetic which can be important depending on the use of the chamber. Aluminum is cheaper than Stainless Steel from a raw material perspective. Although Aluminum is easier to machine, it is more challenging to weld, especially when it comes to obtaining UHV quality welds. Aluminum is notoriously prone to having porosity issues in the welds. If the proper weld prep designs, cleaning procedures, and weld settings are not utilized chamber performance can deteriorate. Although Aluminum material is cheaper, adding bi-metal transitions to convert back to Stainless Steel connections can become expensive. Meyer Tool has extensive experience designing and building custom Aluminum chambers and weldments. We have built many high quality Aluminum (UHV) ultra high vacuum chambers and systems. We are able to assist you in evaluating your design criteria and determining if Aluminum is the right choice for you. Stainless Steel has been the go to material for years when it comes to (UHV) Ultra High Vacuum chamber design. Stainless Steel is easier to weld and therefore cheaper to build when a design requires a considerable amount of weld work. Stainless Steel is also very easy to clean in order to consistently get down to ultra high vacuum ranges. Although Stainless Steel is not as easily machined as Aluminum it does machine better than more corrosion resistant alloys such as Inconel and Hastelloy. Stainless Steel conflats and ports are readily available and do not require the use of any bi-metal fittings. Stainless Steel is also a much tougher material compared to Aluminum so it stands up to wear and tear on seal surfaces and general structural wear better than Aluminum. Most of the welding and machining work that we take on at Meyer Tool involves Stainless Steel. Our welders and machinists are very familiar with its material properties and fabrication requirements. 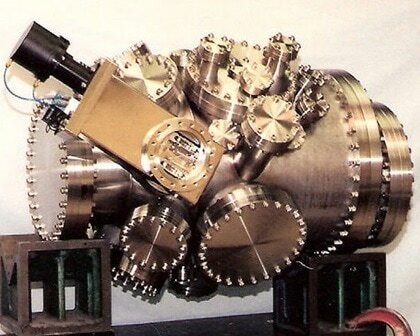 Meyer Tool has been fabricating Ultra High Vacuum chambers out of Stainless Steel since 1969. Our engineering staff can design a system to your specifications or we can develop fabrication plans around your existing prints. Sometimes the conventional material choices, (Aluminum and Stainless Steel), just will not work for certain UHV applications. In some cases weight is the driving factor when it comes to material selection. At other times, corrosion resistance plays the lead role in decision making. 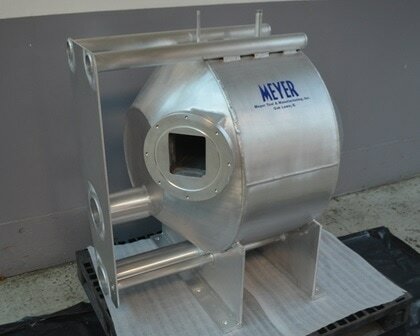 At Meyer Tool, we have seen our fair share of unique material requirements related to the design and fabrication of custom Vacuum chambers and chamber components. Titanium, Inconel, Monel, and Hastelloy are just a few of the different alloys we have worked with while building ultra high vacuum chambers. We can work with you to find the optimal material choice for your particular application. In addition to selecting the material for the chamber there are many different plating, polishing, and coating options that are available. Our staff can work with you to find the right mix of design, material, and post processing to find the optimal cost, time, and quality mix for your project.